Summary: This file includes subject correspondence relating to the United States Postal Service. Topics in the correspondence cover but is not limited to postal law, Mother's Day telegrams and mail threats. This file is part of a bigger collection of Governor Clyde M. Reed correspondence. Part of: Records of the Kansas Governor's Office. 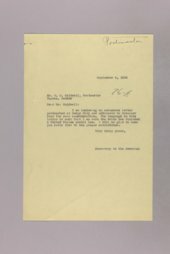 Records of the Kansas Governor's Office : administration of Governor Clyde M. Reed (1929-1931).